Energize your creativity as you stroll through the beautiful Minnesota summer! Continue (or begin! ), the journey of discovering, re-engaging, and deepening your creative self by exploring Walking in This World, Julia Cameron’s long-awaited sequel to the international bestseller The Artist’s Way. Adding weekly walks to The Artist’s Way tool chest as a way of discovering and recovering the creative self, we will move towards getting in touch with our curious and creative inner artist, our deeper feelings, and truer thoughts. Class time will include hands-on creative experiences, insightful reading and discussion, and take-home prompts for thinking, doing, and playing to keep you inspired! 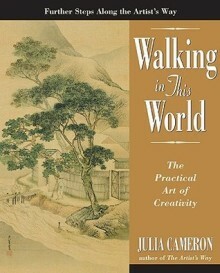 No art experience or familiarity with this book or The Artist’s Way required, but students will need to bring a copy of Julia Cameron’s Walking in This World:The Practical Art of Creativity. The most recent edition is available at Wet Paint.